The race for the lead in Thursday night’s 50-lap Super Late Model feature at New Smyrna Speedway might not have been all that exciting, but you won’t hear any complaints from the race winner. 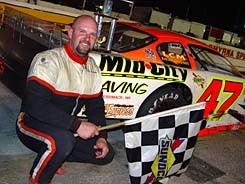 Louis Mechalides won his second feature event of Speedweeks, becoming the first Super Late Model driver to repeat in six nights of racing competition. It was a picture perfect night for Mechalides. 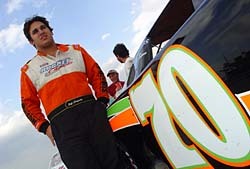 He was the day’s quickest qualifier and pulled a “0” pill just after qualifying, meaning that he would start on the pole for the event, the first time the Super Late Models have started straight-up since Speedweeks started on Friday. halfway in the race to fix a loose wheel. After that, it was smooth sailing for Mecahlides, who pulled away and dominated the rest of the night. It was an impressive run and Mechalides was happy being he first repeat winner during Speedweeks. Louis Mechalides celebrates his second win of Speedweeks. The other positive that came out of the night for Mechalides besides the win was the fact that he is now right back in the championship hunt thanks to an early accident by points leader Ted Chrostopher. Will that mean Mechalides will be more conservative during the final two nights of competition? Even though the race for the lead might not have been all that exciting, that didn’t mean the race was lacking any excitement. The biggest excitement came just after the halfway point, when Speedweeks championship points leader Ted Christopher, running third at the time, got into an accident with the fourth-place running Trevor Stewart. Ted Christopher and Trevor Stewart head to the wall (top), then to the garage (bottom). Coming off of a restart, Stewart dove inside of TC heading into turn one. The two drivers made contact, sending Stewart into the wall head on and TC slamming against the wall in a driver’s side door-first hit. Both drivers were ok after the hard accident, but neither was very happy with each other. “What the f--k was that?” said a dejected TC after the race. “Obviously the f--king guy just sailed the thing in there. The best thing I saw was, when I was spinning backwards, I see him hit the wall head on. What a idiot man. This guy here said he’s never seen that guy drive into the turn that hard in his whole life. Stewart’s perception of the accident was a little bit different. “We got cut right off,” said the former ASA driver. “I was up to his door. I don't know. I guess his spotter never told him we were there and he came down the track and wrecked us both. I'm not sure what he was thinking. Maybe he didn't know I was there. TC even walked over to look at Stewart’s damaged car in the infield and got into a brief shouting match with one of Stewart’s crew members. Mike Fritts gave the fans exactly what they like to see… a very exciting show by watching a man determined to get back to the front. A night after winning his first feature of Speedweeks, Fritts looked to be the only driver that had anything for eventual race winner Louis Mechalides. However, around lap 35, while running second, Fritts pulled the car to pit road to fix a problem with the left rear. In the remaining 15 laps after his stop, the fans were treated to some serious excitement, watching Fritts fly by cars left and right, determined to get back to the front of the field. At the end of the race, he’d made his way all the way to fifth. “We had a good car, a really good car,” said Fritts. “I was just riding and I was telling my guys that I was just riding, waiting until he gets a little bit worse so I can get by him a little bit easier when I decided to make my move. He had a good car too. Mike Fritts (#112) looked to be the only driver that had anything for Mechalides (#47). “Then, we had a little problem with the left rear wheel. I don’t know what happened, but luckily we caught it under caution. We came in and got her tightened up and had to work our way through the field. Oh well. We will made up some points. Dean Cornelius surprised many people, maybe including himself, by finishing an impressive second in Thursday night’s 50-lapper at New Smyrna. David Rogers followed Cornelius most of the night, hounding him and pressuring him quite a bit, but Cornelius never succumbed to the shots for his position. “There was a lot of pressure there. You just try not to screw up and to stay in a rhythm. I just try to do my best. Rogers wasn’t overly happy with his car, but was happy that another top-five run fell his way. give up near the end. I was hoping to have a little more there at the end. There were a couple cars I had to work harder on getting by and I think that cost me. Ohio’s Jack Landis has really come into his own late in the Super Late Models at New Smyrna. 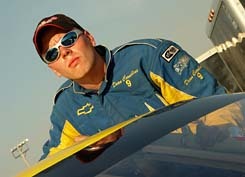 Before the week, a win looks like it could be a possibility for the Late Model veteran. Switching to his second car over the last couple of night has been the key. “Too bad we couldn’t have had this baby out right off the bat,” said Landis. “We had some woes and it took us a few days to get her ready, but we’ve got her out now. Eddie Van Meter technically clocked in with the quickest time in qualifying on Thursday, but started the 50-lapper at the rear of the field. Why? That made for a long night for Van Meter, who had to come through the entire pack of cars and dodge all of the wrecks. After 50-laps, he’d made it up to the 10th position, where he finished. After so much success at New Smyrna Speedway to start out his career, Jeff Choquette has looked nothing like his usual self the last couple of nights at New Smyrna Speedway. 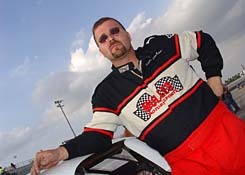 Choquette started his career at New Smyrna Speedway by winning the first four races he ever raced at the track. Over the last two nights of Speedweek action, he’s finished seventh and 32nd, after just completing eight laps on Thursday night. “I kind of want to hide my head and hide from everybody,” said Choquette. “It's kind of hard to come here and win four in a row and qualify up front. But the car has been blowing water the past two nights we've been down here. I think it's a head gasket. We thought we would make it through the night but I guess we didn't. They told me pull it in before it blows up. Jeff Choquette and his #70 have struggled the last two nights at Smyrna Speedweeks. Jay Middleton had a lot of issues during the day on Thursday, but was able to overcome them for a sixth-place finish. Middleton and the team found they had a bent spindle and spent the day looking for another. Finally, at the last minute, they found one and went on to race with little practice. Super Late Model up-and-comer Ryan Crane showed up at New Smyrna for the first time on Thursday night and had a solid run, coming hoe ninth. It was an impressive run after the Freddie Query prodigy qualified a dismal 18th and held off several bumps from JR McMichle during the race. Former CRA Super Series champion Scott Hantz, who has struggled most of the week, had his best run of Speedweeks thus far, coming home eighth after staying out of trouble, something that has been his problem much of the week. Several nights, Hantz has been the innocent victim of accidents. Justin Drawdy returned to action after taking Wednesday night off. Drawdy was running up front before he brushed the wall and fell back to seventh near the end. Drawdy parted ways with his crew chief on Wednesday, prompting the team to take the day off. Michele Jourdain Jr. returned to the cockpit of the #10x after missing Wednesday’s competition. Jourdain had to start at the back of the pack after Sprint and Midget standout Bobby East qualified the car for him. 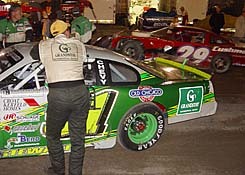 Jourdain was at Daytona during the day practicing his Busch car. SS Racing’s Chase Austin looked to have his best race of Speedweeks going, running in the top-15 after qualifying 13th before an accident on lap 37 took him out of the running. Evan Jackson showed up to Smyrna for the first time this Speedweeks, but mechanical problems sidelined him just 16 laps into the feature.